Durango Silver Company specializes in Turquoise beaded Earrings made by Nattarika Hartman. We have been collecting Turquoise beads for over forty years and we continue our search for new Turquoise beads to add to our collection continuously. We produce many unique Turquoise beaded Earrings with Turquoise as well as many other gemstones. We make many Turquoise beaded Earrings with Southwestern gemstone color themes that are very colorful and certainly unique to our company. We use Sterling Silver findings on our beaded Earrings unless otherwise noted. Above and on the left is a pair of contemporary Carnelian, Silver and Turquoise beaded earrings by Dillon and Nattarika Hartman. These wonderful dangle Turquoise earrings feature a Sterling Silver and Blue Gem Turquoise drop, which is hung from Carnelian, and Blue Gem Turquoise beads. These Carnelian, American Turquoise beads and Silver beads are set on sterling silver wire to make up these fashion Turquoise Beaded Earrings, which is hung on a sterling silver French wire. The Blue Gem Turquoise roundel beads were cut form American Turquoise mined in Nevada, USA. The inlayed Turquoise drops were made by Dillon Hartman from sterling silver and inlaid with natural Blue Gem Turquoise. 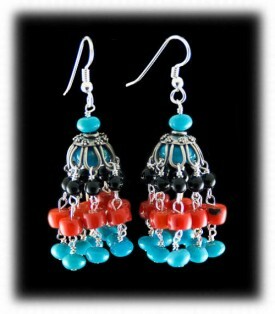 These are great examples of fashion style Turquoise Beaded Earrings. 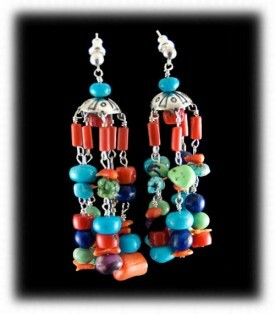 To the right is a pair of contemporary fashion chandelier multi color beaded earrings by Nattarika Hartman. 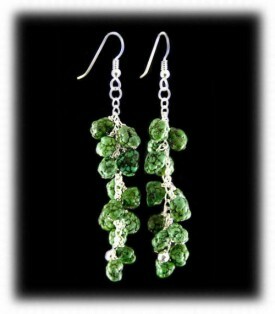 These flashy fashion beaded earrings have many different shapes and color's of gemstone beads on sterling silver wire. These earrings feature Blue Gem American Turquoise, Mediterranean Coral, Lapis Lazuli, Sugilite, Tortoise Turquoise, and Mojave Green beads. These fashion beaded earrings were artisan handcrafted in Durango, Colorado USA. Above to the left are a pair of spirit design Silver and blue spiderweb Tibetan Turquoise beaded earrings by Nattarika Hartman. These great fashion Turquoise beaded earrings focus on two natural blue spiderweb nugget, Tibetan Turquoise beads. These beads are set on Sterling Silver and feature daisy pattern Sterling Silver beads underneath each nugget. Above these top grade Tibetan Turquoise beads is a handmade pure silver (99.9%) spiral design. This is all hung from a handmade Silver, French wire. These blue fashion Turquoise beaded earrings were handcrafted in Durango, Colorado USA. To the right are a pair of Black Onyx and Blue Gem Turquoise beaded earrings by Nattarika Hartman. These are easy to wear fashion beaded earrings that are sure to become a classic in your wardrobe. This pair of Earrings feature two sections that are linked together with Sterling Silver to give the earrings lots of movement. 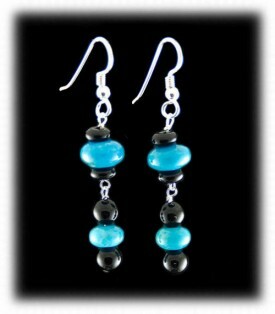 The bottom section is made up of Black Onyx round beads with a small Blue Gem Turquoise roundel bead in between them. The top section has two small Black Onyx beads, with a Large Blue Gem Turquoise roundel bead between them. This is all hung from a Silver French wire. These Nevada Turquoise earrings would be a great addition to your contemporary Turquoise Jewelry or Southwestern Turquoise Jewelry collection. These beaded earrings were artisan handmade in Durango, Colorado USA. Above and to the left is a nice pair of Turquoise Chandelier beaded Earrings that are very attractive when worn as they have large unique filigree Sterling Silver beads as a focal point of the earrings. The Turquoise is a beautiful color of sky blue and from the Campitos Turquoise Mine in Northern Mexico. The Campitos Mine is producing great clear blue Turquoise and in very popular worldwide. You can read more about this pair of Blue Turquoise beaded Earrings on their presentation page and you may also enjoy our presentation page on Green Turquoise Jewelry. Above and to the right are a pair of unique lime green Turquoise Earrings made by Nattarika of Durango Silver Company. She has beaded this pair of earrings so they have a nugget look and this is very attractive when worn. The findings are Sterling Silver and they hang from French wires. Above and to the left are a pair of green Turquoise Chandelier beaded Earrings. They were made by Nattarika with Tortoise Turquoise and Black Onyx beads and they were made with Sterling Silver Findings. 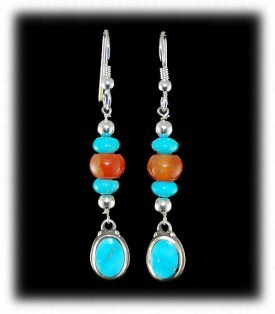 This is a great pair of Turquoise Fashion Earrings and Turquoise Jewelry as well! See our presentation page on fashion Turquoise beaded Jewelry. To the right is a very nice simplistic pair of Turquoise beaded Earrings that have a lot of style and class. 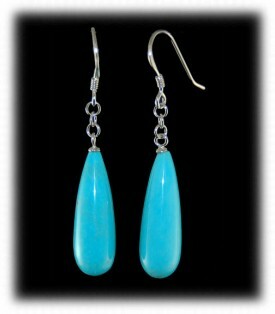 The long sky blue teardrop Turquoise beads are beautiful and very attractive. 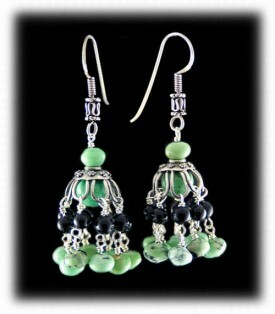 They hang from Sterling Silver french wires and are light and comfortable to wear. This is a great style of Turquoise Earrings that can be worn often as they are light in weight and go with almost any attire. 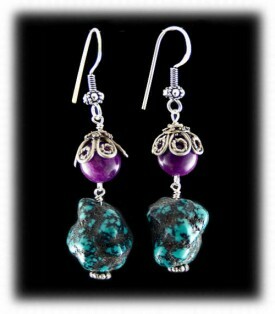 Above and to the left is a very nice pair of Sugilite and Chunky Turquoise beaded Earrings. This beautiful and attractive pair of beaded Earrings were made with Sterling Silver findings and they were made by Nattarika Hartman of Durango Silver Company. The Turquoise Nugget beads are exceptional quality Tibetan Turquoise and the round Sugilite beads are scarce as well. To the right is a fancy pair of fashion Turquoise, Coral, Black Onyx and Sterling Silver beaded Earrings that are flashy and a fun pair of Southwestern Earrings to wear. They have a lot of gemstones beads, yet, they are still lightweight and easy to wear. We invite you to browse our online store where you will find a lot of great Turquoise beaded Earrings as well as a resource for you to learn more about Turquoise Jewelry. 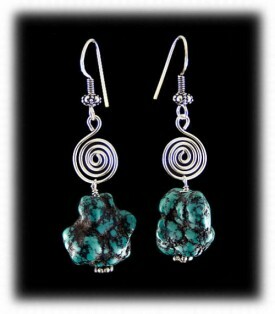 Come back often to see new Turquoise Beaded Jewelry and Turquoise beaded Earrings as they are added daily. We also invite you to join our Newsletter group, once a month we send out a newsletter with all kinds of good information and special promotions. We have a monthly Silver Jewelry Giveaway for our Newsletter members, we give away free Silver Jewelry as well as free Turquoise Jewelry each month, it's great and you have a chance to win again every month. We hope you have gained some useful knowledge from our Turquoise beaded Earrings educational presentation page. We invite you to learn more about Silver Jewelry, Indian Jewelry and Turquoise Jewelry by following the links in our Learning Center which has many other informational pages that we have written on topics related to Southwestern Silver Jewelry. In addition, we would like to invite you to join our E-Mail Newsletter - about once every other month we send out a Newsletter to inform our members of what's happening with Durango Silver Company, new products, specials for our members and more. We also have a monthly drawing from our members to Giveaway free Turquoise Jewelry from our company. Please take a moment to become one of our friends and future winners in our giveaway by signing in below. 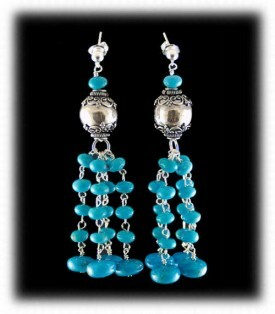 Thanks for viewing our page on Turquosie beaded earrings, we hope you have learned something.